The Animated Series: Get ready for an adventure! Talking Ben’s a substitute teacher and he’s got epic ideas for the kids’ science fair project! But with Talking Ginger in the class, things don’t quite go to plan. 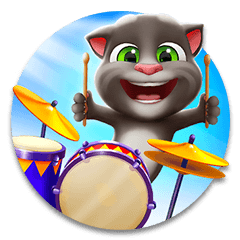 Talking Tom’s favourite movie is about to debut its 8th installment and the guys are super excited. But – GASP – Talking Angela’s never watched it! Email fail! Talking Tom accidentally just sent a top secret master plan to his enemy, the CEO. Can he stop it reaching him? TalkTalking Tom has to decide between breaking Talking Angela’s friendship bracelet and saving his friends. What will he choose? It’s not such a winter wonderland when Talking Angela gets heckled off the stage, but no one knows who did it.